There are five bands with a similar name: 1. "The Chariot" The Chariot is a chaotic metalcore band from Douglasville, Georgia. They are signed to newly formed label Good Fight Music after putting out their prior three studio albums through Solid State Records. 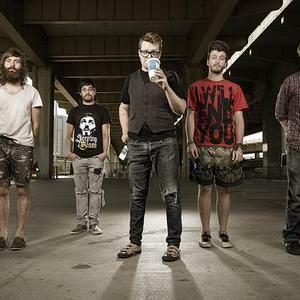 The Chariot was formed in 2003 by ex-Norma Jean front man Josh Scogin. Their debut full length album "Everything Is Alive, Everything Is Breathing, Nothing Is Dead, And Nothing Is Bleeding" was recorded live with minimal digital editing which produced a less polished sound. The Chariot is a chaotic metalcore band from Douglasville, Georgia. They are signed to newly formed label Good Fight Music after putting out their prior three studio albums through Solid State Records. The Chariot was formed in 2003 by ex-Norma Jean front man Josh Scogin. Their debut full length album "Everything Is Alive, Everything Is Breathing, Nothing Is Dead, And Nothing Is Bleeding" was recorded live with minimal digital editing which produced a less polished sound. Their wild and manic behavior onstage helped create a great impression for them in the underground, despite numerous lineup changes they have managed to keep this reputation for the duration of their career. In the winter of 2005, they released an EP entitled "Unsung" which featured two new songs, and four re-recordings from "Everything Is Alive, Everything Is Breathing, Nothing Is Dead, And Nothing Is Bleeding." This EP saw The Chariot's chaotic, feedback-inducing sound replaced by slightly more polished production, while still containing the rather harsh songwriting that they had become known for. On April 3rd of 2007, they released their second full-length album called "The Fiancee." This album followed suit with the "Unsung EP", as the production was more well-defined and evened out. The last track on the album is the first and last verses of a hymn called "The Trumpet," sung by The Sacred Harp Singers choir (www.awakemysoul.com). The Sacred Harp Singers also sang at the end of "And Shot Each Other," and "Then Came To Kill" is a re-recording of "Kenny Gibler (Play The Piano Like A Disease)" from the "Unsung EP", and features Hayley Williams, the lead singer of Paramore on vocals. In 2008, Dan Eaton and Jake Ryan left the band to pursue their band Queens Club. Jon Terry also left the band. The bassist, Jon Kindler, stayed marking the first time in the history of The Chariot that one member of the line-up, except Josh Scogin, had stayed for more than one album. The new (and still in place) Chariot lineup consists of various numbers from Canada natives I Hate Sally, and the local Georgia band The Rein. This line-up went on to tour throughout Europe for most of 2008 and then it was announced that they would be writing and recording their third full length, to be released on May 5th, 2009. "Wars And Rumors Of Wars", the third full-length album from The Chariot, and fourth release overall, came out on May 5th, 2009. While the cleaner production of "The Fiancee" was still existing, the overall feel of the album was much heavier and very reminiscent of their earlier cacophonous sound. The album was hand stamped and hand numbered, and was released at the dawn of The Chariot's first U.S. tour of 2009, supporting alongside Car Bomb for Gojira's "The Way Of The Flesh" Tour. "Long Live", the fourth studio album released by The Chariot. The album was released through the band's new label Good Fight Music after leaving Solid State Records. The album was again produced with Matt Goldman. On November 23, 2010 the album was released. Chariot is a NWOBHM band from London. Their full-length debut was the hard-hitting "The Warrior" in 1984. A year later, they released an EP called "All Alone Again". In 1986, they released their second full-length album "Burning Ambition". The first two albums of this band are a very representative example of the eighties British hard rock. Some NWOBHM enthusiasts may describe their sound as a cross between Diamond Head and Mot?rhead with a more upbeat ambience. Their fan based extended from the UK and Europe right up to Japan. For a short time they played alongside the European tour of classic heavy metal act, Manowar. The Chariot disbanded in 1992. Some of its members continued playing in a newer band called ?Dirty Deeds" with a more hard-rock sound. Dirty Deeds was lead by Pete Franklin. The band reformed in 2004 and it was quite a busy year of Chariot releases! The same year they released two compilations -- "Early Days, Late Nights" and "What Goes Around", a DVD release of their 1986 live recording "Sweating Blood - Live At The Marquee" and additionally a demo Promo CD. In 2006, they came back with all new material with their full-length album "Behind the Wire". The last album strongly resonates their NWOBHM eighties days. A trio of the late 60s. Their music is often depicted as being influenced by the band Cream. All band members - except the drummer Pug Barker - apparently disappeared without a trace. A single album project involving The Posies' Ken Stringfellow and Brian Young (now in Fountains of Wayne), along with White Flag's Pat Fear and Javier Escovedo of The Zeros. The album was titled "I Am Ben Hur" and was released in 1997 and is punk/power pop in style. It features cover versions of songs by Alex Chilton, The Choir, Los Bravos, The Count Five and Paul Revere and the Raiders mixed with originals by all band members. A great album, but sadly their only album. A Christian metal band from the mid-80's. They recorded two demos and were in two compilations - White Metal Invasion (1989) and Underground Metal (1988). Paul Avilas was the vocalist and Louis Filardo was the lead guitarist.